MINNEAPOLIS/ST. PAUL – The Minnesota Lynx today announced the team has signed Head Coach Cheryl Reeve to a multi-year contract extension. Reeve has also assumed the role of General Manager and has announced the following updates to the team’s basketball operations staff for the 2018 season: Clare Duwelius has been promoted to Assistant General Manager while Assistant Coaches Shelley Patterson and Walt Hopkins have agreed to multi-year contract extensions. Assistant Coach James Wade remains on staff. Per team policy, terms of the deals were not released. 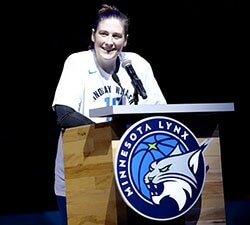 Reeve wrapped up her eighth season as Lynx Head Coach in 2017, leading Minnesota to a 27-7 record and its fourth WNBA championship in the last seven years, tying the Houston Comets for the most titles by one franchise in league history. Since taking over in Minnesota, Reeve owns a career 195-77 record, the most coaching wins in franchise history. She was initially named Head Coach on Dec. 8, 2009, replacing Jennifer Gillom. Under Reeve’s tutelage the Lynx have compiled 195 wins, the most prolific eight-year run in WNBA history. This past season Minnesota registered its sixth 25-win campaign while becoming the first franchise to win 27+ games in a season four separate times. Reeve’s .715 career winning percentage ranks first in league history; she’s one of just two coaches to win more than 60% of their games (Van Chancellor, .655). Reeve becomes the sixth dual Head Coach and General Manager currently in the WNBA, joining Amber Stocks (Chicago), Curt Miller (Connecticut), Pokey Chatman (Indiana), Bill Laimbeer (Las Vegas) and Mike Thibault (Washington). Duwelius recently completed her fourth season with the Lynx as Basketball Operations Manager, having been responsible for the day-to-day tasks of the basketball operations department including organizing travel arrangements, scheduling of practices at home and on the road, facility setup for the Lynx and visiting teams, as well handling all uniform and equipment related tasks for members of the Lynx basketball program. A native of Des Moines, Iowa, Duwelius graduated from Wayne State (Nebr.) 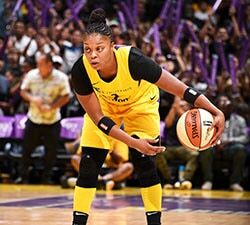 College where she played basketball and earned her degree in Sports Management, and then obtained her Master’s in Business Administration degree from Southwest Minnesota State University. Patterson enters her eighth season as an Assistant Coach with the Lynx. She provides support in opponent scout preparation and game planning as well as individual player development. Prior to her arrival in Minnesota, Patterson, a 23-year coaching veteran in both the professional and collegiate ranks, worked for three seasons on Brian Agler’s staff in Seattle. 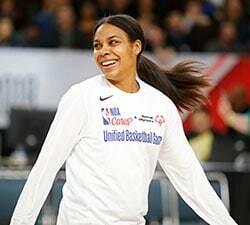 Patterson also spent eight years working in different capacities with five WNBA organizations, including the 1999 Houston Comets championship team. The 2017 season was Wade’s first as an Assistant Coach with the Lynx. In his role with the Lynx, Wade assists with the team’s scouting efforts, talent evaluation, and player development. He joined the Lynx staff after serving as an Assistant Coach with the San Antonio Stars from 2013-16. In 2012, he joined San Antonio as a basketball coaching intern and went on to be hired as an assistant coach in 2013. During his time with the San Antonio, Wade coordinated the Stars’ defense and was responsible for leading individual player development. He also assisted with team development, video breakdown and game planning. Hopkins completed his first season in Minnesota as an Assistant Coach. He has over a decade of experience as a basketball coach at the professional, collegiate and high school levels. Hopkins worked in the WNBA as the Player Development Coach for the Tulsa Shock (2013) and has also served as Assistant Women’s Basketball Coach at Utah Valley University (2013-14).